From Chicago to Detroit, New York City and the Philippines, then back to New York and the Broadway stage, the life of Delores LaVern Baker followed a pattern unlike any of her contemporaries. Born in 1929, she was a distant relative of Memphis Minnie, aware of the success the notorious "Hoodoo Lady" achieved in an era when it was difficult for a black female singer to gain any sort of foothold. Delores was impatient; she sang in seedy after hours joints on Chicago's south side during her teens and worked her way up to the larger Club DeLisa by the time she was 17. "Little Miss Sharecropper" was a nickname given her by club management, a curious tag for a city girl, but she played the part for the steady work. Momentum didn't slow when her family moved to Detroit in 1947; she was hired as a singer at the Flame Show Bar, a popular spot for some of the jazz world's hottest stars. Fletcher Henderson caught her act in 1948 and helped get her into a recording session, briefly, at Columbia Records; the revolving door thankfully didn't hit her from behind on the way out. The following year she made a couple of bluesy jazz records with Eddie "Sugarman" Penigar for RCA Victor billed as Little Miss Sharecropper, and her somewhat under-the-radar recording career had begun. She continued performing in Detroit and made her way back to Columbia in 1951, supplying the vocals for "Good Daddy," a record by Maurice King and his Wolverines, a band that had backed her at the Flame Show Bar (about the same time Johnnie Ray, one of the all-time most soulful white singers, performed at the club); label execs ditched her nickname and the rural image that went with it, crediting her as Bea Baker, a name that could easily have become her permanent professional sobriquet. Columbia revived the Okeh label that year and she recorded two more singles with the Wolverines, "I Want a Lavendar Cadillac" the highlight, an audacious big band R&B number. About the same time she made a couple of records for the National label, again with the ill-fated nickname, though it was shortened to Miss Sharecropper. In 1952, Delores found herself in a better situation with Syd Nathan's King Records. As a vocalist for The Todd Rhodes Orchestra she was identified for the first time as LaVern Baker on "Trying" (written by Billy Vaughn, the song had just put Kentucky quartet The Hilltoppers on the musical map). 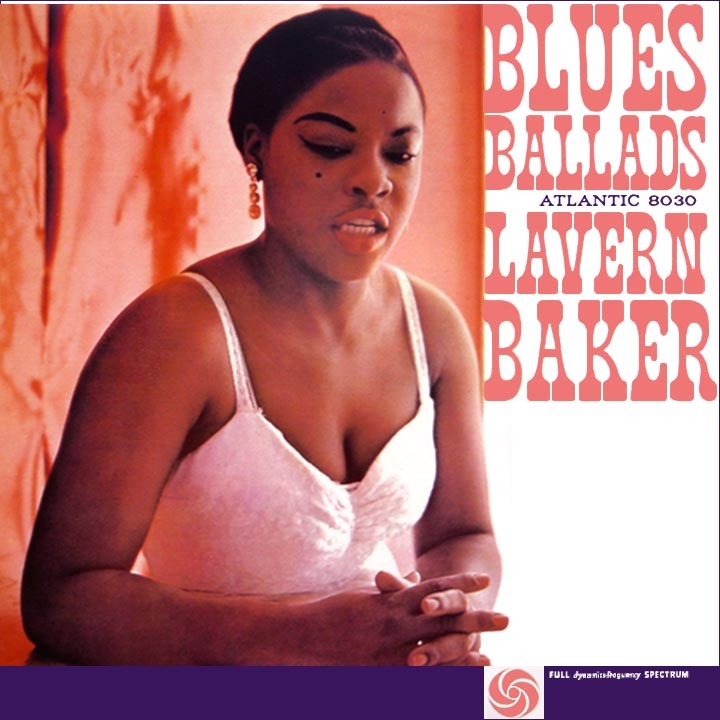 While not a hit, LaVern's version received a fair amount of airplay in some cities. After three more singles with Rhodes, she embarked on a solo tour of Europe and was well received. On returning to the States in 1953, she sought a situation that would free her from the "band vocalist" tag and establish her as a solo artist. New York's Atlantic Records, already riding high for a few years with Ruth Brown, felt she had similar potential and signed her to a contract. "Soul on Fire," written by LaVern with Jerry Wexler and Ahmet Ertegun (calling themselves Jermet), possessed an intimacy less evident on the vocals of her earlier efforts, but it wasn't as successful as the company had hoped. The first handful of Atlantic recordings had a bluesy gospel feel (though with perceptibly secular lyrics); after the second release failed, producers Ertegun and Wexler pointed her in a lighter pop-rock direction and a successful formula resulted. 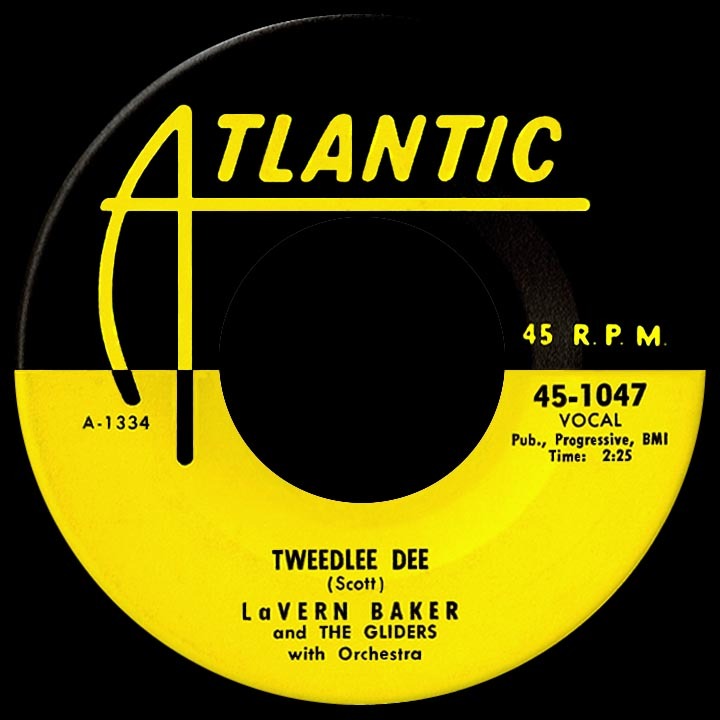 Winfield Scott's "Tweedlee Dee," with backing group The Gliders (actually The Cues, heard on many of the label's recordings including a number of Ruth Brown hits as The Rhythmakers), overflowed with a joyful hint of Latin rhythm that appealed to both pop and R&B fans, becoming a hit in both formats. A cover version by Mercury's Georgia Gibbs, also with backing vocals by the Cues (they really got around when it came to session work), cut off Baker's ascent, becoming a much bigger pop hit. LaVern sought legal recourse and found she had none, a bone of contention that stayed with her for years. Looking at the bright side, she had finally scored her first hit record after nearly a decade of performing. "Bop-Ting-A-Ling" (a Clarence Paul-William Garrett composition) was delivered in the same exuberant style as "Tweedlee Dee" but with a bit of a gospel lean ('Great day in the mornin', man!') and, like the previous single, it became a top ten R&B hit. Bill Campbell's "Play it Fair," a ballad, made it three in a row. 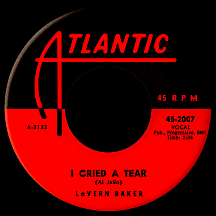 The more poppish the sound, as with the two-sided autumn '56 hit "Still" and "I Can't Love You Enough," the better shot LaVern had at reaching a larger audience; with rock and roll acts coming on strong she began to emerge from underneath Ruth Brown's shadow and, in fact, made the transition to the mainstream more easily and successfully than "Miss Rhythm," establishing herself as Atlantic's top female act in the decade's second half. Soon the company was referring to her as their "unofficial 'Ambassadress' of Rhythm and Blues." "Tra La La," released in late '56 (she performed it in the film Rock, Rock, Rock! starring Alan Freed), was once again upstaged by a Gibbs cover, but there was much less need for concern this time...the single's flip side drove home the point that this fabulous Baker girl was in a league of her own. Lincoln Chase created "Jim Dandy," one of the coolest of all fictional rock and roll creations ('...the kind of guy, never liked to see a little girl cry...Jim Dandy to the rescue...') ranking alongside legendary '50s characters like "Speedoo," "Mr. Lee," "Johnny B. Goode" and Way Out Willie (who did that crazy Hand Jive). Arguably her greatest record, LaVern's assertive vocal with its raucous 'Go, Jim Dandy!' made it an instant rock classic. Sequel "Jim Dandy Got Married" went top ten R&B in its own right (Buddy Holly repeated the pattern several months later with "Peggy Sue Got Married"). "Humpty Dumpty Heart" ventured into fairy tale territory and marked her second appearance in a movie with Alan Freed, Mister Rock and Roll. "It's So Fine," her only chart hit of 1958, established a brief early connection to the coming Motown empire; it was written by Berry Gordy, Jr. and Tyran Carlo, who at the time were devoting most of their energy to Jackie Wilson's career. 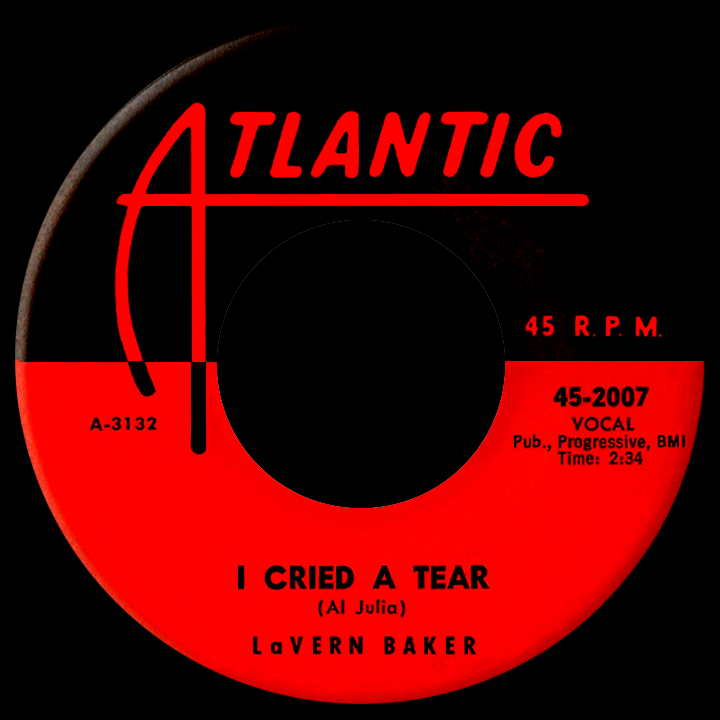 Baker's powers were at their strongest in 1959 as she lyrically plumbed the depths of despair. "I Cried a Tear," written by Al Julia (his only hit as a songwriter) went top ten pop and peaked at number two R&B, the biggest hit of her career (oddly, the melody and sax riff were borrowed from "What Am I Living For," a hit several months earlier for Atlantic's Chuck Willis). Follow-up "I Waited Too Long," from the pens of Neil Sedaka and Howard Greenfield, was equally as morose as its predecessor and nearly as big a hit. She had a hand in writing the next two singles, "So High So Low" and "Tiny Tim," and released three 45s with a Kay Starr connection, including a remake of Kay's 1952 chart-topper "Wheel of Fortune." Output remained strong during the decade's first couple of years. "Bumble Bee," written by Baker with Leroy Fullylove (another one-hit songwriter, though the song impacted a second time thanks to British band The Searchers) and "You're the Boss," a duet with The Ravens' bass man Jimmy Ricks, were brazen delights. Jerry Leiber and Mike Stoller pulled a full-throttle gospel performance out of LaVern with "Saved," a top 40 hit in the spring of '61. The 1924 Ma Rainey classic "See See Rider" made the R&B top ten for the second time in late '62 (Willis, calling it "C.C. Rider," had also did the trick in '57; later, The Animals put their rockin' version in the pop top ten). One final chart appearance on Atlantic came in February 1965 with Bart Howard's often-recorded "Fly Me to the Moon." Leaving Atlantic after 12 years with the label, she moved to Brunswick Records, managing only one minor chart single at the beginning of 1966, "Think Twice," a duet with Jackie Wilson. Jumping on the Batman bandwagon after the January debut of the smash ABC-TV series, she reinvented her rock and roll child, "Jim Dandy," as the Caped Crusader, with the novelty single "Batman to the Rescue." She remained with Brunswick for a couple of years but supported herself mainly through public performances. While appearing in Manila later in the decade, she accepted a position as entertainment director for a nightclub at the U.S. Subic Bay Naval Base. She made her home in the Philippines and worked at the military facility for the better part of two decades, finally returning to the U.S. in the late 1980s. Once back, she met with newfound respect and more opportunities than she'd had since her '50s heyday. Higher-profile engagements followed, peaking with a deja vu moment: in 1990 she replaced Ruth Brown as the lead in the Broadway musical Black and Blue, much as she had supplanted her as the premier diva of Atlantic Records some 35 years earlier. Lows followed highs; a diabetic for many years, her health took a downward turn and a 1994 operation resulted in the amputation of both legs. It didn't dampen her enthusiasm, though; LaVern Baker continued performing until her death at age 67 on March 10, 1997.